I hemmed and hawed about going to CocoaConf and after deciding that I did want to go I went to register only to find that it was sold out. I placed my name on the wait list thinking that it would be unlikely that a spot would open up. But then one did! And now after attending my first CocoaConf in Washington, D.C. March 28-29 I wish I hadn’t waited so long to attend one. The conference was well organized and graciously hosted by the Klein family was a sold out event. The session content and the presenters were top notch. Pre-conference all day sessions (available as part of the full conference package) had sessions suitable for neophytes (All Day iOS Tutorial taught by James Dempsey) to more advanced developers seeking to expand their knowledge. I attended AV Foundation Film School taught by Chris Adamson, which was great. 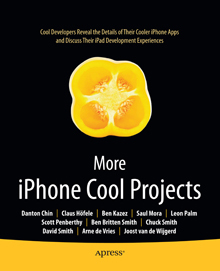 And I’m sure the other two were as well — iOS 7 2D Game Development taught by Josh Smith and Jonathan Penn the authors of Build iOS Games with Sprite Kit and Introduction to OpenGLES and GLKit Handson taught by Ray and Vicki Wenderlich). The sessions were presented by seasoned professionals and authors Jonathan Blocksom and Mark Dalrymple of the Big Nerd Ranch, Daniel Steinberg, Ray Wenderlich, Mike Ash, Josh Smith and Jonathan Penn, and Mark Pospesel to name but a few. But what was totally unexpected was the level of sharing and community shown by the speakers. The keynote γνῶθι σεαυτόν (Know Thyself) by Mark Dalrymple as well as the keynotes by Casey Liss and Dave Wiskus were amazingly personal and sharing about each speaker’s challenges that had to be overcome in order for them to be creative teachers, artists, authors, and developers. All this sharing was meant to motivate the attendees to step outside of their comfort zones and achieve. Motivational therapy at a tech conference! But it wasn’t all serious. There was lots of fun as well. The CocoaConf Game Show hosted by Daniel Steinberg was made all the more enjoyable by Jonathan Penn’s irrepressible imitation of Sir Jonathan Ive. The jam session by James Dempsey and the Breakpoints (you can buy his single “The Liki Song” on iTunes and sign up for his mailing list) provided light evening entertainment. And the Unprofessional talk show with hosts Dave Wiskus and Jaimee Newberry interviewing Casey Liss was a discussion on anything but iOS and work. And where else would you find Jonathan Blocksom being so kind as to give up his lunch time in order to take 3D pictures of attendees? It was terrific to see that the traditions of the Mac developer community are being carried over to a newer, bigger, and better Mac and iOS developer community. And I for one hope to attend another CocoaConf conference and that you’ll decide to experience this community first-hand yourself. So if you are thinking of going go ahead and get a ticket! 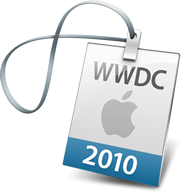 WWDC June 11 – 15, 2012 sells out in under 3 hours! Unbelievable! WWDC June 11-15, 2012 tickets just went on sale around 8 AM EST today. And I got one! Hope to see you there. Get one while they last (not long)! ‘Twas the nights, days and weeks before the engineers and scientists at Apple unveiled to all registered developers the pre-WWDC iOS beta. During this wondrous period all could wonder aloud about what the new beta might bring. In the past I predicted that Grand Central Dispatch and Blocks were coming to iOS. 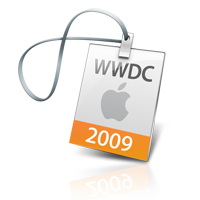 GCD and Blocks were introduced in iOS 4.0. As were enhancements to the NSOperation and NSOperationQueue classes. At the time I also conjectured that OpenCL would come to iOS. Hindsight of course reveals that it was too early. However, I think that the time has come for many reasons. When OpenCL is added as a public framework iOS developers will have a complete range of options with which to build a concurrent solution. Second, Apple’s implementation of OpenCL is built on top of Grand Central Dispatch which is now a part of iOS. Third, the OpenCL compiler uses Clang and LLVM which are being used to build iOS apps. Fourth, the new iPad has twice the pixel density as the iPad 2. And as always there are and will be applications that push the limits and require better performance. And last, OpenCL is in iOS 5.1 as a private framework. OpenCL was definitely not present in iOS 4.3 and may or may not have been present as a private framework in iOS 5.0. The existence of OpenCL as a private framework is perhaps the most compelling reason that OpenCL will become a public framework. It is so tantalizingly close. So, before the pre-WWDC beta is released and the veil of secrecy falls over the land as enforced by the NDA let the speculation begin! What do you think will be part of iOS 6? Add your prediction below but comments will be closed as soon as the pre-WWDC beta is released. Ok. Ok. It is Friday but just because it has been a long work week and it is Friday doesn’t give you an excuse to not participate in adding your voice to ask Apple to fix Radar. By making Radar more transparent. By making it easier to browse a list of existing bugs. By making it easier to file bugs that impact your work. These and other Radar deficiencies have long been discussed by Mac and iOS developers. It has even led to a community effort to list bugs that have been filed at Open Radar. If WWDC 2012 were announced today everyone knows all 5,000+ tickets would have been sold out in a few hours — certainly well before the end of the business day. Fixing Radar is just as important as going to WWDC. Read about this community effort to ask Apple to fix Radar on your favorite news site such as TNW The Next Web or the Apple Insider. Better yet just go to Fix Radar or GTFO and follow the few simple instructions to add your voice in asking Apple to fix Radar. I was 391st with rdar://11249772. Ultimately regardless of whether your voice was the 5,001st or the 6,000th every voice is important. What number were you and what was your rdar? Several weeks ago during a working lunch I discovered that tickets for WWDC 2011 were on sale but decided to wait until I got home to purchase the tickets. Well, as with many of you that delay left me out in the cold! Since then I have been checking for details on the sessions to get an approximation of how much I would be missing. No luck here either! Although I’ve been to WWDC the last two years I don’t remember if the session details were available to everyone or just to attendees. With only 12 days until the start of WWDC the lack of details leads me to speculate as to why that might be. Is it because Apple has taken secrecy to an entirely new level? Is it because Apple is too busy with the changes that will come with Mac OS X 10.7 Lion? Or is it because there are massive changes for the next iOS beta? I think they are just too plain busy! I’d love to hear what you think though!